I have enjoyed Joe’s work immensely. His promptness, attitude and skills in painting and design have been greatly appreciated. Joe has an ‘ear’ to listen to the needs of his customers. He definitely is a GREAT find! Carol L.
Signature Painting enjoys over 30 years of experience in painting which began as a painter’s helper. 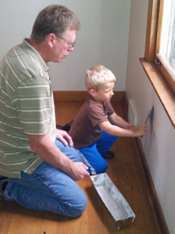 Joe Germain began his love of painting while helping his future father-in-law working part-time side by side. Joe loved to paint so much that in 1991 after the closing of the plant where he had worked for over 17 years, he decided to go at it full time! At that time, the company was named, “Pro Painting Plus” and celebrated 13 successful years before selling and moving to Green Bay. After almost three years of working for someone else, Joe felt the need to get back to his passion and decided to once again operate his own business, offering the best of his contracting experience now known as Signature Painting Service, LLC.